This entry was posted in Tossman Cryptic Crossword Solutions and tagged answer, crossword, cryptic, solution, tossman on September 8, 2017 by pavlov.a. 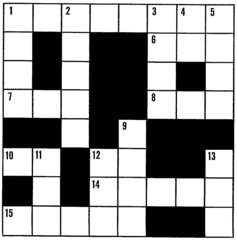 Could you please explain 5 down clue for crossword number 1045. I think the answer is ‘hurricane’ but don’t know why! Thanks. Good question, Trea! The easy bit is ‘Rotten, raunchier’ which signifies an anagram of ‘raunchier’ – but it took me a little while to work out the rest of the clue. ‘Capital’ refers to Wellington and ‘back’ is a rugby player. The Wellington rugby team are the Hurricanes, so a hurricane is a back (perhaps) with this team. Tricky!